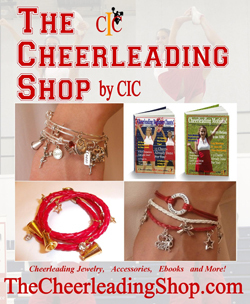 Welcome to the Cheerleading Info Center - CIC, the #1 destination on the web for all things cheerleading, cheerleading jewelry and more! We know that you love cheerleading so we have HUNDREDS of Pages, Photos and Videos that give you the best instruction, tips and insight to all things cheerleading; so click on the links in the sidebar and get started! Enjoy! Do you Twitter? We do! Follow us on CheerInfoCenter for even more cheerleading information! Do you want to see yourself or your team on CIC? 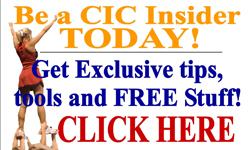 Send us your photos and videos and let us share them here on CIC. CLICK HERE for the submission form. Do you have some great ideas to help your community? Has your team volunteered at a recent event or center? We would love to hear all about it! Check out our new blog dedicated to making our communities great -Cheer Up! We want to be your site for everthing cheerleading, fun, fasion, and entertainment. So check back often and don't forget to give us your ideas and what you would like info on.